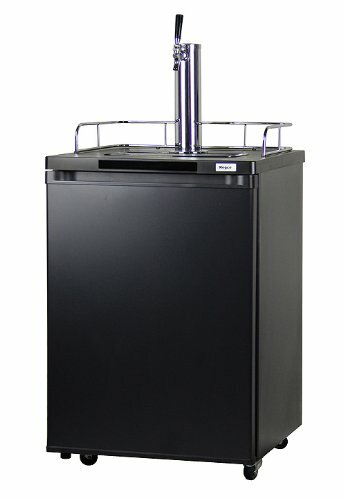 Purchase Kegco K209B-1 Full-Size Kegerator Keg Cooler Beer Dispenser at Discounted Prices ✓ FREE DELIVERY possible on eligible purchases. INCLUDES COMPLETE KEG TAPPING KIT: This kegerator comes with all of the components necessary to pressurize and tap a home brew Cornelius keg, including upgrades like a polished stainless steel draft beer tower, premium dual gauge CO2 regulator, and 5 lb. aluminum CO2 tank with glossy red finish at no additional charge. You will be up and running quickly... all you'll have to do is get the CO2 tank filled and provide the keg! LARGE INTERIOR: This home-brew keg cooler features a spacious interior that can easily hold up to three 5-gallon Cornelius ball lock home brew kegs, so you can keep multiple kegs stored at their ideal temperature and ready to dispense. When you've run out of home-brewed beer to dispense, or whenever you need some additional refrigerated storage, this versatile kegerator can be easily converted into an all-refrigerator with two adjustable shelves to hold your food and beverages. LONG-LASTING DURABILITY: To help make sure that your new keg dispenser will be pouring home brewed beers for years to come, we'e included a stainless steel interior floor mat that ensures long-lasting durability and allows your beer kegs to glide smoothly in and out of the cabinet when loading and unloading. This high-quality, high-performance homebrew kegerator is CSA listed, and all dispensing accessories are UL recognized components. POWERFUL AND ENERGY EFFICIENT COOLING TECHNOLOGY: The manual thermostat control and energy efficient design allow you to adjust the temperature of the interior between 35 degrees Fahrenheit and 42 degrees Fahrenheit to enhance the flavor and consistency of the brews you are serving at any given time while causing minimal impact to the environment and your energy bill. The adjustable mechanical temperature control can be easily accessed at the back of the unit.